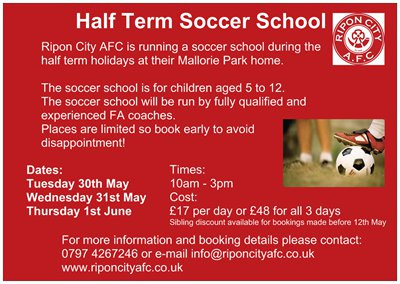 Following on from the last successful and well attended soccer school, Ripon City AFC are running a soccer school during the May holidays at their Mallorie Park home. The soccer school is for children from school ages 5 to 12. The soccer school will be run by fully qualified and experienced FA coaches. Sibling discounts available if bookings made before 12th May.